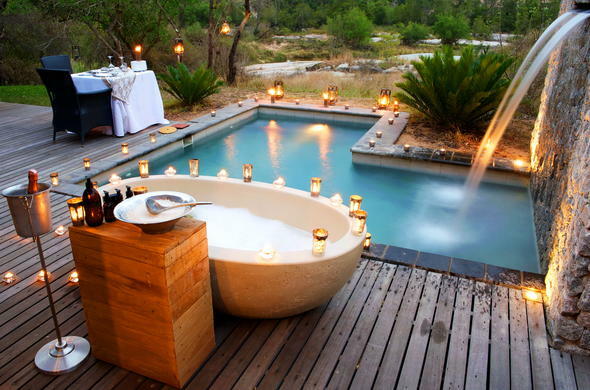 It's a dream come true, that never to be forgotten luxury bush honeymoon in Sabi Sand Game Reserve. Feel like royalty as you savour every spectacular detail at these superb lodges in the renowned Greater Kruger National Park. You and your loved one can expect a truly romantic retreat in the wilderness. The Sabi Sand Private Game Reserve is a highly sought after safari destination because it co-joins the magnificent Kruger Park along an unfenced border. Exceptional game viewing at close range is possible due to the free movement of game between habitats and permanent water sources.Here are three Sabi Sand lodges that epitomise the ultimate honeymoon retreat. Each lodge has a different appeal but you can count on intuitive service and thoughtful touches during your stay. Exciting day and night dame drives and bush walks are offered, plus a range of other relaxing activities. For the ultimate start to your married life, Londolozi Granite Suites set the scene in exceptional style. Expect definitive service and meditative luxury while you explore the renowned Sabi Sand Game Reserve on private safari activities. Your own game drive vehicle is a one of a kind, custom fitted Land Rover with a lovers couch - this bush chariot is small enough to take you to all the secret places of Londolozi. No detail is overlooked and your suite provides every creature comfort - enjoy the tranquil sitting room, glass encased bathroom, outdoor shower, heated plunge pool and the 'piece de resistance', a private outdoor bath for 2 overlooking the river.Honeymoon Highlights: Your own safari vehicle and guide and a tailor-made itinerary, private dinners and as much champagne as you want, picnics in the wilderness, intimate dinners for two, romantic turn downs and a couples massage in the bush overlooking the Sand River. At the confluence of the Sand and Mabrak rivers, you'll find the beautifully serene Leadwood Lodge. Taking only 8 guests at a time, this exclusive lodge offers supreme privacy with its strategic design and intimate spaces on various levels. Personalised game viewing encounters are offered deep in Leopard country with expert guides. Each suite has floor to ceiling glass windows, under floor-heating, a plunge pool and a romantic outdoor shower. The full bathroom includes a designer free-standing tub for bubbly soaks. Attentive staff and lots of little treats and luxuries ensure unforgettable memories are created.Honeymoon Highlights: You and your loved one can retreat to your gorgeous suite where a blazing fire has been lit and a private dinner has been set up. Other delights include dinners for 2 in different settings, his and hers massages and romantic turn downs. Olde world romance and colonial charm define this sumptuous lodge. Expect sofas you can sink into, soft lighting and authentic collector's items throughout. This exquisite home from home in the bush offers legendary game viewing activities and particularly peaceful nights. Selati Camp features turn of the century elegance in individual thatched suites under towering indigenous trees, each with a full bathroom and an alfresco outdoor shower. There are 2 superior suites with additional features such as plunge pool for truly deluxe retreats. World-class cuisine is served overlooking the riverbed, in the atmospheric boma and in the farmhouse kitchen. Lanterns, oil lamps and firelight add a warm glow to the camp after dark.Honeymoon Highlights: Champagne bucket, candlelit petal strewn bathroom and in-suite dining plus a lovely fruit basket.